If you’re hunting for income, your job just got a lot tougher, and it’s all the Federal Reserve’s fault! Fed Chair Jerome Powell’s recent cave-in on rate hikes means the central bank is out of action for the rest of 2019—and its next move could even be a cut. Sure, this has been great for stock prices, which surged 8% since the new year. But it’s crushed dividend yields, leaving you with far fewer buys to get the 6%+ yields you need to retire on dividends alone. Look at how this past month’s price gain has compressed the average S&P 500 stock’s yield from a pathetic 2.1% to a very pathetic 1.9%! To put that in dollars and cents, if you invested a million dollars today, you’d get a measly $18,700 in income—down from $21,000 a month ago! It’s a slap in the face if you’re in, or nearing, retirement. And forget about Treasuries: if you’d invested your mil in the 10-year as recently as November, you’d have gotten $32,400 in income. Today? $27,300—or nearly 16% less in just two months. No wonder desperate folks have piled into my favorite high-yield plays—real estate investment trusts (REITs), owners of properties ranging from hospitals to warehouses and self-storage units. REITs have soared even higher than the S&P 500 this year! 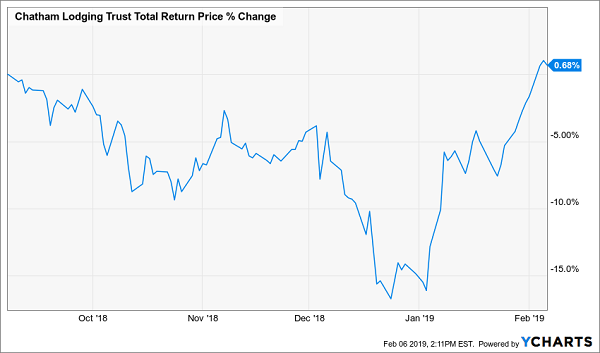 REITs are below their pre-selloff 2018 high and a full 8% off the all-time peak they crested in the “rate-panicked” days of August 2016. With the Fed in a deep freeze, they’re cleared to crush that high in short order! But we’re not going to pick the lazy option and buy VNQ, because you can tap individual REITs for much higher dividends (I’m talking 6%+ here) and/or explosive dividend growth. REITs must pay 90% of their taxable income as dividends. But for many folks, that fact goes out the window when they’re judging REIT performance. Consider healthcare REIT Omega Healthcare Investors (OHI), which looks pretty lame on a price basis. The takeaway? Make sure the chart you’re reading includes dividends paid (so it reflects total returns). 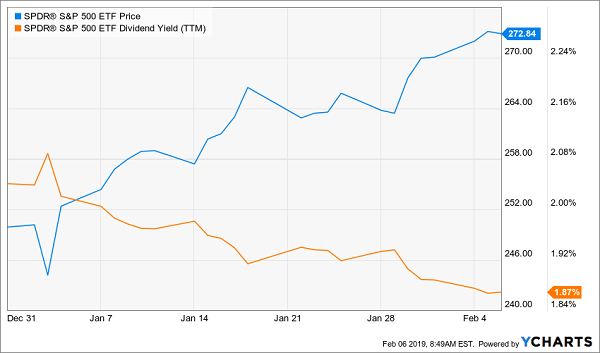 When it comes to dividend safety, the payout ratio should be your first stop: you get it by dividing the yearly dividend payout into earnings per share (EPS), or better yet free cash flow (FCF) per share, which is much less prone to manipulation than EPS. In “regular” stocks, I demand a payout ratio less than 50%. Higher than that and you risk a dividend cut and near-automatic price crash when that bad news hits. But like price charts, the EPS and FCF payout ratios don’t do the job with REITs. To show you what I mean, I’ll dial up OHI’s cousin, Physicians Realty Trust (DOC), which rents space to doctors and pays a nice 5.1% dividend. Yikes! According to this, DOC has paid out more cash as dividends than it’s generated in the last 12 months, and more than four times EPS. Luckily for us, these are the wrong numbers to look at. With REITs, you want funds from operations (FFO), of which DOC generated $1.09 a share in the last four quarters. Since it paid out $0.92 in dividends per share, its real payout ratio is 84%. “Wait, isn’t 84% still unsafe?” you’re probably thinking. That’s another difference with REITs: well-run ones like DOC can easily manage ratios up to 90% (and figures that high are pretty common). That’s because they’re mostly pass-through entities: they collect steady rent checks, take what they need to keep the lights on and send the rest to you. That brings me to my next point: stock screeners aren’t usually set up to use FFO when reporting payout ratios and valuation metrics, like price-to-FFO ratios (more on that next). Do it the old-fashioned way by diving into the last four earnings reports and adding up the per-share adjusted or normalized FFO. Then use that to calculate your price-to-FFO or payout ratio. When a REIT’s price-to-FFO ratio gets out of whack with its fundamentals, or with those of its rivals, you should take a closer look. And when this number jumps too far too fast, it could be time to make an exit. Hotel operator Chatham Lodging Trust (CLDT) is a textbook case: it traded at a bargain 8.4-times FFO in December 2016. Why was that a bargain? Partly because first-level investors fretted that Chatham’s hotels would be overrun by the likes of Airbnb. But that ignores the fact that most of its hotels are near airports or in suburbs, far from the downtown cores the Airbnbs of the world roam. That incredible 22% average yearly growth was driving a surging dividend, up 57% in just three years! 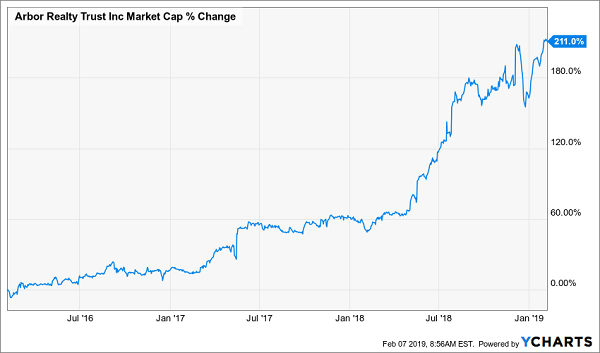 Best of all, this stock was yielding 6.8%—its highest level ever. That ticked all our boxes: high yield, fast dividend growth and a cheap valuation. I issued a buy call in the December 2016 Contrarian Income Report. Fast-forward to September 2018, and CLDT was at 10.7-times FFO, meaning its share price was now far outrunning FFO. The cat was out of the bag on this one, so we contrarians checked out—taking a 26% total return with us! The bottom line? 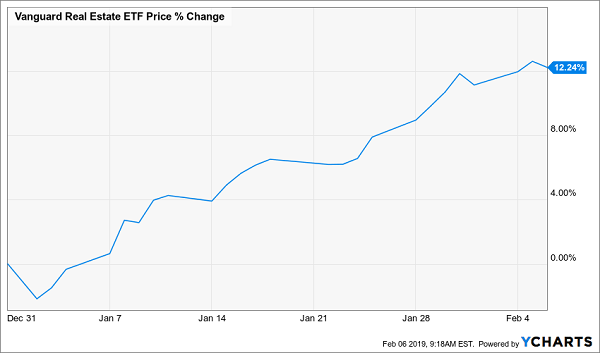 While price-to-FFO isn’t the only number to watch, its movement compared to a REIT’s history and FFO growth—and the ratios of similar REITs—can give you a strong hint of whether it’s time to buy (or sell). 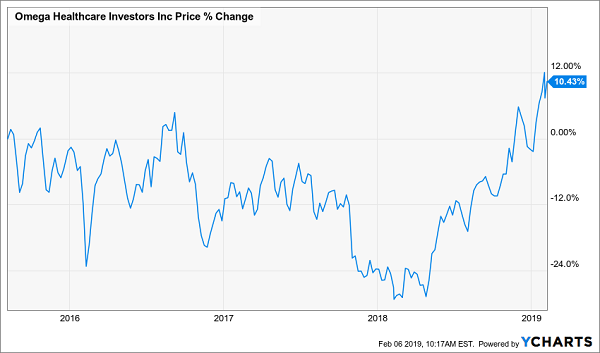 Insider buying is one of my favorite things in a stock, because it ties management’s goals to ours and pushes the C-suite to look past the quarterly earnings bonanza. An example: Ivan Kaufman, founder and long-time boss at Arbor Capital (ABR), a REIT that makes loans for commercial and multifamily properties. Three years ago, Kaufman, owner of 740,000 Arbor shares, made a daring move for the then-tiny company, dishing out $250 million to buy a commercial-lending agency and its in-house technology platform. Fast-forward to today, and the new and improved ABR is twice as valuable in terms of market cap! Unfortunately, big insider stakes like Ivan’s are far too rare (most execs would rather let shareholders take all the risk!). You can easily spot stocks with high insider ownership through most screeners. Or you can just dial up the 18 stocks in our Contrarian Income Report portfolio (average yield: 7.4%), many of which are run by manager-owners. $40,000 in Income on $500K. Here’s How. I’m ready to give you the names of all 18 of the stocks I just mentioned (and yes, they include REITs) now! Just click here to get instant access to our 7.4%-paying Contrarian Income Report portfolio. And that’s just the start, because you’ll also get “insider access” to my proven “8% No-Withdrawal” retirement portfolio. 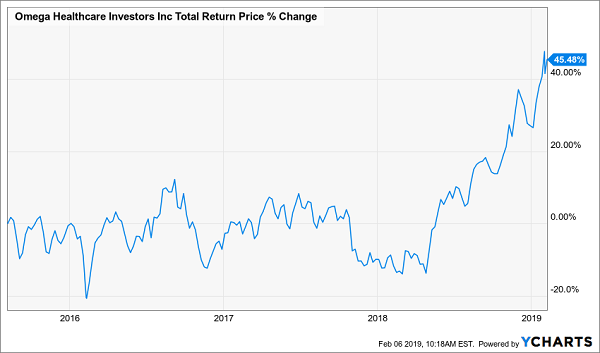 It’s an ironclad package of 6 REITs and other too-often ignored high-yield plays—like closed-end funds and preferred shares—I’ve meticulously crafted to do one thing: let you retire on dividends alone, without having to sell a single stock in retirement! And you can do it on a $500K nest egg. Because thanks to this unique portfolio’s safe 8% average dividend, you’ll be clocking a nice $40,000 a year on your $500K. That’s enough to retire on in many parts of the country—and forget about the market’s daily gyrations for good. It’s all waiting for you now: click here to get full details on the 18 stocks in our CIR portfolio (average yield: 7.4%) AND my 6 “power dividends” for 8% income and a “no-withdrawal” retirement.